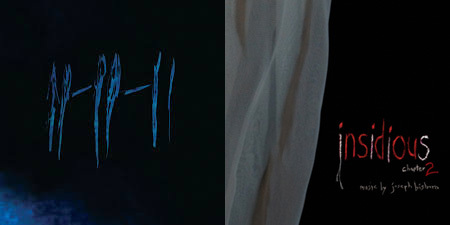 Listening to Joseph Bishara's scores for 11-11-11 and Insidious Chapter 2 have made for a really uncomfortable week. Bishara's work, which is currently available on vinyl from Void Recordings, isn't exactly easy listening. While the majority of horror movie soundtracks that have been making the rounds lately have their roots in more synth-driven avenues, Bishara's work hearkens back further to the likes of Bernard Herrmann. Utilizing a string quartet as the bed, then augmenting with piano and vocals, Bishara's work is familiar in spots -- in opening movements and recurring themes, you hear the uncomfortable build and release inherent in most traditional film scores. Yet, it's the dissonance that really makes the soundtracks to these films work so well. The quiet, nearly inaudible pieces will sometime flair with violent string bursts, giving the listener the auditory equivalent of a jump scare. Listening to Insidious Chapter 2 was quite honestly one of the most frightening listens I've had in a good long while. I was sitting in my living room, reading a book, during my first listen, and was several times given such a start that I lost my place in what I was reading -- indeed, I very nearly dropped my book. The eerie atmospheric nature of both releases makes them more akin to musique concrète than standard symphonic works. Rather than the music following a melody -- although, at times, it does -- it seems that the music is more intentionally responding to actions on-screen. It's almost as if Bishara is aiming for something more to set nerves on end and frazzle one's sense of well-being than following any sort of musical standard. It's a rare thing for film scores to operate on their own like this, freaking one out without a single frame of film having run. Much like the music, the artwork for these vinyl releases is also minimal -- a hint of fog or fabric on the cover, with the film's title scratched into the cover with a bit of spot-varnish to offset it from the matte background. Same font and color scheme for the liner notes, and the LPs are packaged in poly-lined sleeves. These are releases that treat the music with the utmost respect, and serve to complement the core, rather than existing as collectable tchotchkes. Both LPs, as well as Joseph Bishara's scores for Insidious and Dark Skies, can be purchased from the Void Recordings shop. This entry was tagged 11-11-11, horror movies, Insidious Chaper 2, Joseph Bishara, Void Recordings. Bookmark the permalink.